New DisneyStore.com Promo Code: Save 25% on Everything! I wrote about the sale items at DisneyStore.com yesterday, and now there's an even better offer! Save 25% on your entire DisneyStore.com purchase when you use DisneyStore.com promo code DISNEYPAL at checkout! 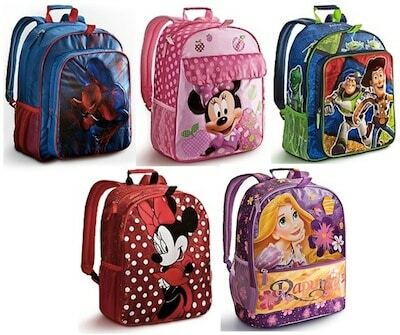 You'll find Disney backpacks on sale for $15, so they're just $11.25 after the promo code. Various character lunch totes are on sale for just $10, which means they're only $7.50 after the coupon code! Lots of plush Disney toys are already $3.99 (up to 68% off!). Get them for $2.99 after the coupon! Toy Story action figures are $2.99 (76% off the regular price of $12.50). Use the coupon to get them for just $2.25! Shop through Ebates to score an extra 3% cash back on your entire purchase from The Disney Store! Plus, new Ebates members who sign up through this link will also get a FREE $10 gift card for Target, Home Depot or Barnes & Noble OR $5 cash!